Insurance brokers play an important role in the Insurance industry; they act as an intermediary between the policyholders and the insurers. Insurance brokerage firms provide professional and technical advice to their clients about insurance products from a range of Insurance carriers according to their clients' needs. The major insurance products sold by the insurance brokers include property and casualty, health, and medical insurance. This report identifies the insurance brokerage market size in for the year 2014-2016, and forecast of the same for year 2021. 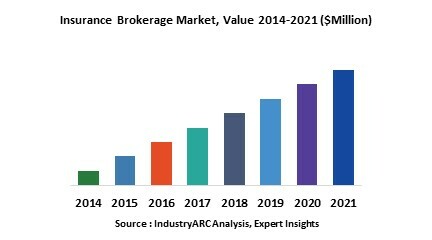 It also highlights the potential growth opportunities in the coming years, while also reviewing the market drivers, restraints, growth indicators, challenges, market dynamics, competitive landscape, and other key aspects with respect to insurance brokerage market. Globally North America dominated the market for insurance brokerage in 2015 with highest market share due to higher awareness about benefits of insurance coverage and also government initiatives to cover all citizens under insurance coverage. North America was followed by Europe as and Asia-Pacific the second and third largest regional market respectively, for insurance brokerage. However, Asia-Pacific is expected to be fastest growing regional segment during the period of study due to fast growing insurance setups in the region especially in India and China along with growing awareness about the insurance coverage in the region. This report on global insurance brokerage covers different type of insurance brokerage activities, insurance products and market size in various geographical regions. This is report has been further segmented into major regions, which includes detailed analysis of each region such as North America, Europe, Asia-Pacific (APAC) and Rest of the World (RoW) covering all the major country level markets for insurance brokerage in each of the region.